Tiger Woods has already won four times in 2013, and will be on the course this week for the playing of the 2013 Memorial Tournament as the defending champion. Not only that, it will be the last event before he gets ready to play the U.S. Open in two weeks. In fact, this will be the last event for most of the top players in the world, as they get ready to take on Muirfield Village Golf Club before tackling Merion. 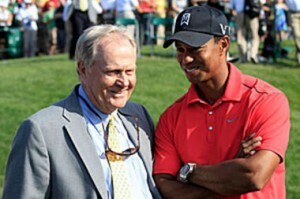 It will be a stacked field this week for Jack Nicklaus’ event, with a total of 120 players teeing it up on Thursday. Of these 120 players, there are 22 Major champions, and 76 total winners on the PGA Tour in their careers. Seven of the top-10 players in the world will be on hand, highlighted of course by Woods, who has won this event five times. Also in the field will be Rory McIlroy, 2013 Masters champion Adam Scott, Matt Kuchar, Luke Donald, Hunter Mahan, Ernie Els, Charl Schwartzel, Justin Rose, and many more. Muirfield Village will be a tough task for players this week. While not the longest course at 7,265 yards and a Par-72, it is quite demanding. Players will need to be precise off the tee, and be able to miss in the right spots if they are offline on the approach. Knowing where to miss the ball on the proper side could be the difference between being in contention on Sunday, and missing the cut entirely. This will be our last chance to see many of the top-ranked players in the world prior to the start of the 2013 U.S. Open. Players aren’t quite in the mindset of Merion yet, with the Memorial coming at a perfect time on the schedule to go against top competition. Woods will be going for a sixth title at Jack’s tournament, and trying to win it in back-to-back years for a second time, though he won three-straight from 1999-2001. This will definitely be a fun tournament to watch, and Woods has the potential not only to get a fifth victory at the Memorial, but it will also be a fifth victory in 2013, before the U.S. Open. He’s already reached four wins faster than any other year. This entry was posted in News and tagged 2013 memorial tournament, 2013 u.s. open golf, tiger woods on May 27, 2013 by Bryan.